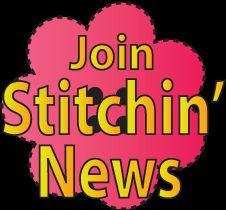 Cookie's Embroidery and Sewing Creations: Part 3: Stitch on with techno savvy where embroidery, die cut and sewing machines meet! 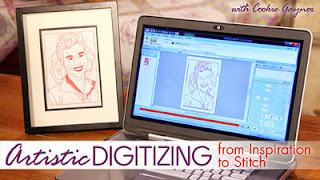 Part 3: Stitch on with techno savvy where embroidery, die cut and sewing machines meet! 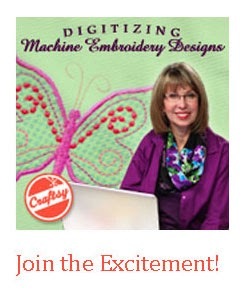 In recent videos loaded to YouTube/CookieSews, the focus has been on creating perfect fabric patches with your die-cutting machine to be used with machine embroidery appliqué designs. Stitching out a design is useful to test the idea and ensure it works. It does so flawlessly. After the test stitches out well, then it is ready to be used on a project. The sample on the left is a hemstitched towel purchased from allaboutblanks.com. Mark towel for placement of the design. Hoop with water-soluble stabilizer and embroider appliqué design. The purple ribbon was stitched over the hemstitch area using the edge foot. 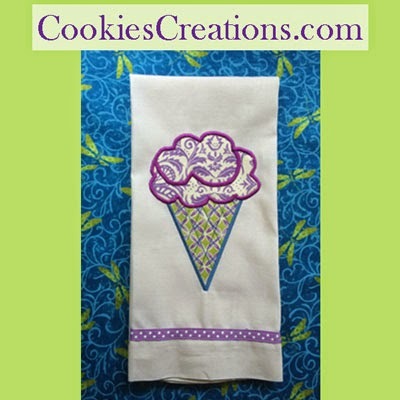 It gives the towel a casual feel and adds color connection to the embroidery design. Tip: Pre-wash the linen and patch fabrics for shrinkage prior to making the towel. It took less than 2 minutes to stitch that ribbon into place. Ice cream design patches created in Part 2 of this series. Need more info on how to use the edge foot? Link for edge foot "how to video"
The next post in this series will be how the appliqué featured design stitches out and why. Well, I think I should try this.